Quick: how do you aim an instrument at the Sun from a moving rocket on a fifteen minute suborbital flight? The answer is very carefully, and NASA plans to do just that today, Thursday, November 6th as the Rapid Acquisition Imaging Spectrograph Experiment, also known as RAISE, takes to the skies over White Sands, New Mexico, to briefly study the Sun. Capturing five images per second, RAISE is expected to gather over 1,500 images during five minutes of data collection near apogee. Why use sub-orbital sounding rockets to do observations of the Sun? Don’t we already have an armada of space and ground-based instruments to accomplish this that stare at our nearest star around the clock? Well, it turns out that sounding rockets are still cost-effective means of testing and demonstrating new technologies. Indeed, there’s a long history of studying the Sun by use of high-altitude sounding rockets, starting with the detection of solar X-rays by a detector placed in a captured V-2 rocket launched from White Sands in 1949. Sub-orbital astronomy in 5 minutes: the flight of a sounding rocket. Credit: NASA. RAISE will actually scrutinize an active region of the Sun turned Earthward during its brief flight to create what’s known as a spectrogram, or an analysis of solar activity at differing wavelengths. This gives scientists a three dimensional layered snapshot of solar activity, as different wavelengths correspond to varying velocities of solar material and wavelengths. Think of looking at layers of cake. This, in turn, paints a picture of how material is circulated and moved around the surface of the Sun. This will be RAISE’s second flight, and this week’s launch will sport a brand new diffraction grating coated with boron carbide to enhance wavelength analysis. RAISE will also look at the Sun in the extreme ultraviolet which cannot penetrate the Earth’s lower atmosphere. Technology pioneered by missions such as RAISE may also make its way into space permanently on future missions, such as the planned European Space Agency and NASA joint Solar Orbiter Mission, set for launch in 2017. The Solar Orbit Mission will study the Sun close up and personal, journeying only 26 million miles or 43 million kilometres from its surface, well inside the perihelion of the planet Mercury. As you can imagine, RAISE relies on clear weather for a window to launch. RAISE was scrubbed for launch on November 3rd, and the current window for launch is set for 2:07 PM EST/19:07 Universal Time, which is 12:07 PM MST local time at White Sands. Unlike the suborbital launches from Wallops Island, the White Sands launches aren’t generally carried live, though they tend to shut down US highway 70 between Las Cruces and Alamogordo that bisects White Sands just prior to launch. 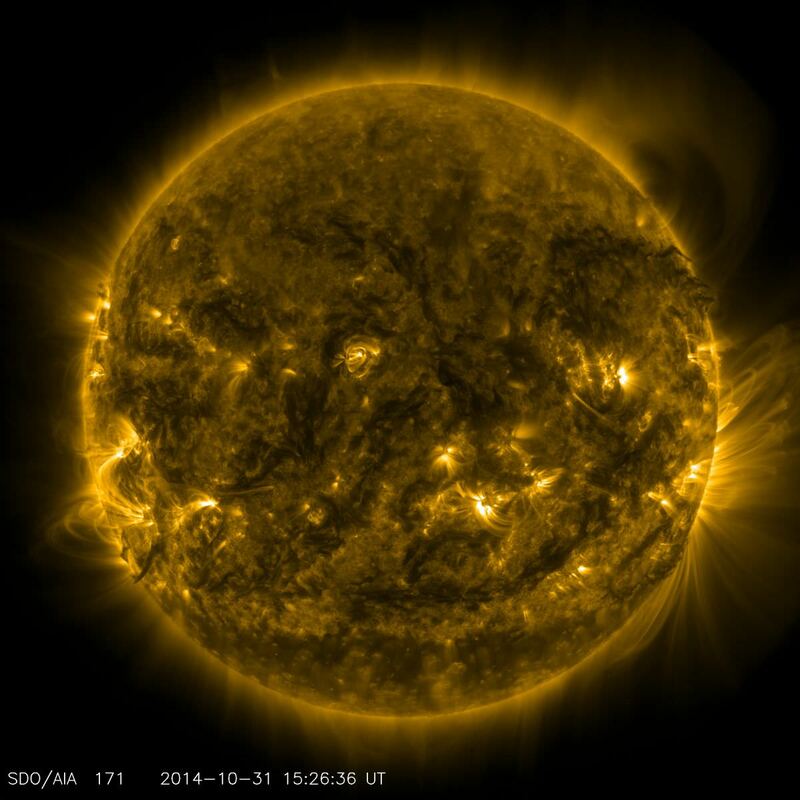 Currently, the largest sunspot turned forward towards the Earth is active region 2205. Another recent mission lofted by a sounding rocket to observe the Sun dubbed Hi-C was highly successful during its short flight in 2013. RAISE will fly on a Black Brant sounding rocket, which typically reaches an apogee of 180 miles or 300 kilometres. Unfortunately, the massive sunspot region AR2192 is currently turned away from the Earth and will effectively be out of RAISE’s view. The largest in over a decade, the Jupiter sized sunspot wowed viewers of the final solar eclipse of 2014 just last month. This large sunspot group will most likely survive its solar farside journey and reappear around the limb of the Sun sometime after November 9th, good news if RAISE is indeed scrubbed today due to weather. And our current solar cycle has been a very schizophrenic one indeed. After a sputtering start, solar cycle #24 has been anemic at best, with the Sun struggling to come out of a profound minimum, the likes of which hasn’t been seen in over a century. And although October 2014 produced a Jupiter-sized sunspot that was easily seen with eclipse glasses, you wouldn’t know that we’ve passed a solar maximum from looking at the Sun now. In fact, there’s been talk among solar astronomers that solar cycle #25 may be even weaker, or absent all together. All this makes for fascinating times to study our sometimes strange star. RAISE observations will also be coordinated with views from the Solar Dynamics Observatory and the joint NASA-JAXA Hinode satellites in Earth orbit. We’ll also be at White Sands National Park today, hoping the get a brief view of RAISE as it briefly touches space. It’s a great time for solar astronomy! Erm, Thursday (today) is November 6th, not November 5th. Just saying. Actually, during launchings at White Sands, US 70 is closed, not I-10. I-10 does not go through White Sands Missile Range. US 70 is also known as Bataan Memorial Highway. Thanks, good catch. I actually realized this as well after we drove it to witness the launch!